We’d been meaning to go to Otley in West Yorkshire for some time. Neil knows one of the former Mayors of Otley, Jonathan Kirkland, who is a fellow pop quiz fanatic and Boris Johnson lookalike. So we were curious to find out what Otley was like. To get to Otley from Manchester is a bit of a pain. We took the route via Bradford so you need to take the turn from the M62 onto the M606 and follow the signs leading to LeedsBradford International Airport. Go past the airport, turn left onto East Chevin Road and this takes you into Otley. Whilst it’s a real chore driving on the A roads to Otley, the final bit is worth it. You see fantastic views of the surrounding countryside as you drop down into Otley, which is situated in the bottom of the valley. I’m still sure there is a better way to get there. Parking in Otley was a chore too. I don’t know how long we whizzed around the streets looking for parking, but the road system is not built for modern traffic. The little car park we found was packed and eventually we found some free on-street parking outside The Cove Chippy and Restaurant. It was early afternoon and Neil is never much company when he’s hungry, so we popped into The Cove restaurant. Despite the overwhelming smell of detergent and fish, we both had a nice fish and chip lunch. The batter on the fish was absolutely lovely and it should be as the place had won an award in 2008. Otley itself is a nice compact town built with solid Yorkshire stone. Whilst it’s not as fancy as nearby Harrogate, the local buildings exuded that Yorkshire no nonsense charm and heritage. The town is a shopper’s delight in terms of gift shops and specialist independent shops. We found there were lots of little courtyards and tiny street off the main rows of shops where you can find little gems and charity shops. We even found a second-hand record store on one side street and I left Neil to browse there. I also liked the fact there were plenty of second-hand bookshops to wander around as well as antique shops. There was also a health food shop that doled out good advice as well as sell stuff. I did find the local witchy store nearby the ‘The Ammo Box’ military surplus store – what a culture clash! 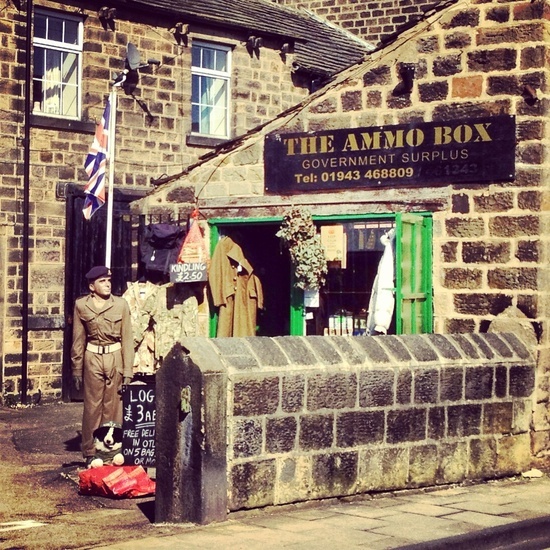 Otley is packed full of cafes offering all sorts of offerings. We liked the name of one called ‘The Rumblin Tum’, which had won an award in 2011 for outstanding customer service. There was also a chippy called ‘Chip-in-Dales’. It turns out Otley has links to the furniture maker Chippendale and not the dance troupe The Chippendales. 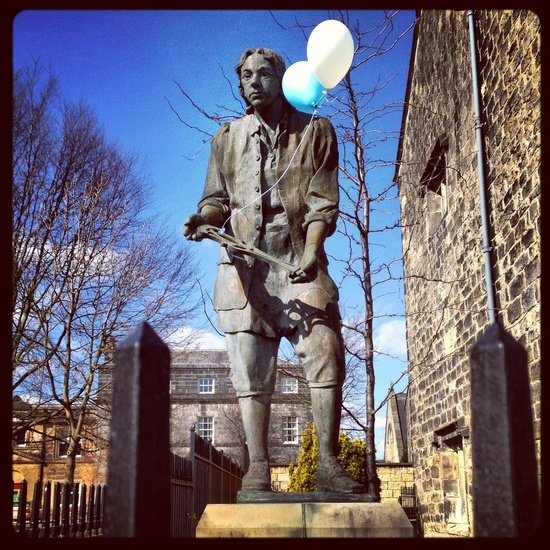 The statue of Thomas Chippendale (furniture maker) can be found by the local art gallery, which was adorned with balloons when we saw it. There are loads of charity shops in Otley and so obviously we had to look in all of them. Neil did find some vinyl records to purchase. The shops were packed full of people browsing. There were a couple of charity shops with decent book sections including Oxfam. I’m sure one had a café attached. 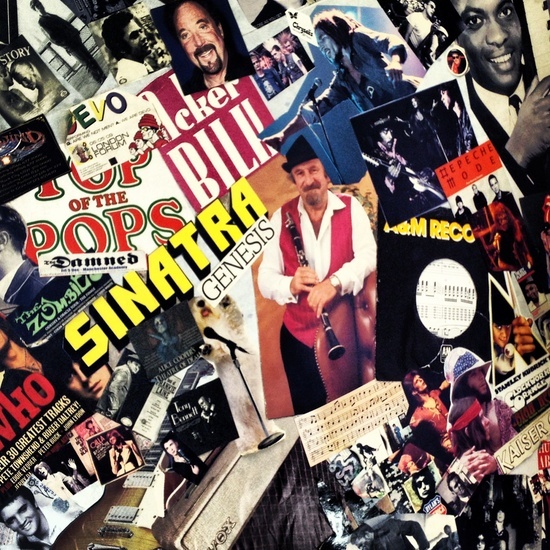 I really liked one which had gone to the effort of decorating the music section with a collage of old pop posters. It reminded me of my bedroom wall when I was a teenager. There is a market in Otley on a Saturday. I’m amazed they could fit it in on the small streets. There was a good mix of stuff on offer from cheap tat to farmer’s market type stuff. I did notice one stall was selling Cath Kitson style bags, but with the label ‘City Girl’ instead – there was some serious copyright infringement going on with those bags. What surprised me were all the little galleries that could be found in Otley. There seems to be a cultural heart to the place, which is always good to see. There were plenty of pubs in Otley. I could imagine you would have a rather good night out in this town. As it was one of few sunny days this year, the pubs were packed full of people enjoying a pint and the sunshine. Alfresco drinking in the UK is often seen as an endurance sport rather than a pleasurable activity, however today it was the latter. 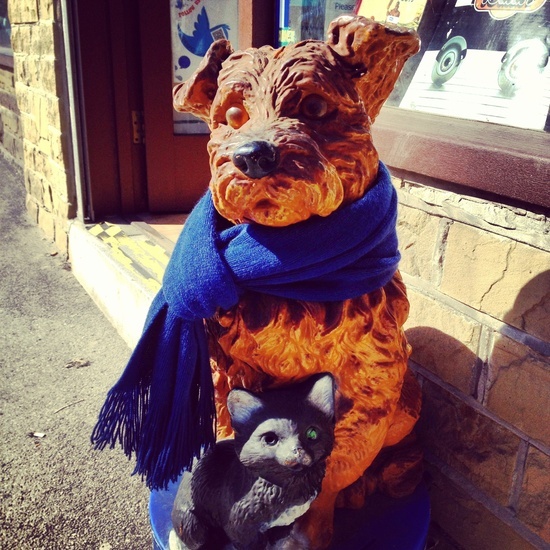 One of the many good things about Otley is that there are plenty of cute, small dogs in the town. So I kept prodding Neil and pointing out ‘cute dog!’ Sadly I couldn’t find a real life dog to photograph, so instead I took a picture of the cute Dog and Cat RSPCA collection box. Apart from loving the name ‘Otley’, it has plenty to offer a visitor passing through in terms of shopping, food and drink. It’s a lovely place to spend browsing round the shops, especially as there are not too many high street chains cluttering up the street. 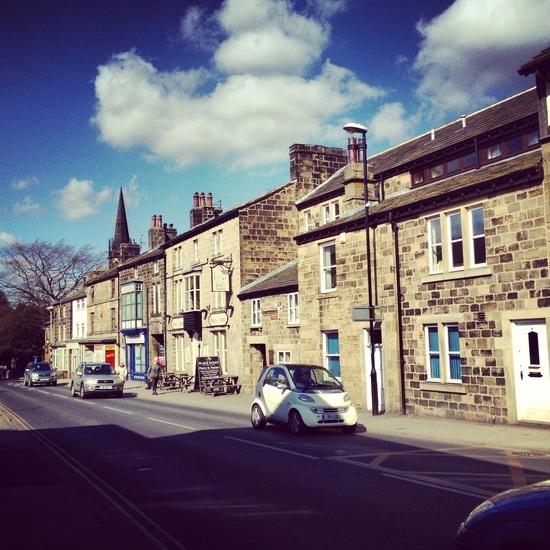 Whilst Otley is definitely more like Harrogate’s common cousin, its down-to-earth charm is endearing and one thing is for sure we’ll be back – as long as I can find a quicker route from Manchester. P.S. If you want to see more photos of our trips pop over to Life in Northern Towns on Pinterest.